Continuing our Different December series, today we celebrate how December is different for a girl named Isemary . . . because of a T-shirt. Our mission at GOEX, the marketplace initiative of GO Project, is to break the orphan cycle through the dignity of work. So . 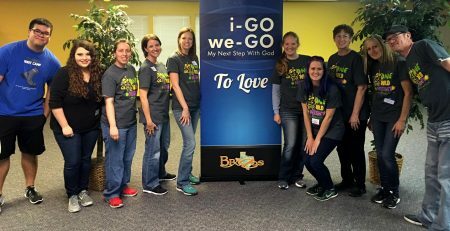 . . What do T-shirts have to do with breaking the orphan cycle? Isemary grew up in the care of one of our local church partners in Haiti. Though you’ve never met her, many of you have given over the years to help her — and children like her — grow and thrive in the love of a local church family, when she otherwise would have been abandoned. And she did her part. She pushed and pushed with a big faith, hopeful for a future brighter than her past. Then she turned 18. The law said she had to leave and strike out on her own. But she was not ready. She joined our very first GO Transition Academy class, and majored in apparel. Others of you gave to help her – and youth like her — develop her character, life skills, and job skills for a very special 2-year season. And, again, she did her part. She pushed and pushed with a big faith, hopeful for a future brighter than her past. On graduation day, the future became the present. So many in Haiti, and elsewhere among the extreme poor, graduate from vocational training school only to find that there’s no job opportunity. They get their graduation certificate and go straight to the aid line. And the orphan cycle begins anew. She graduated and went to work. She landed a job at our apparel enterprise, where she earns a local living wage. How is this possible? Because of the power of purchase. There’s a church in Dallas that chooses GOEX for its church gear. And lots of other churches do the same. There’s a brewery in Kansas City that chooses GOEX for its company gear. And lots of other companies do the same. There’s a ministry in Minneapolis that uses GOEX for its ministry gear. And lots of other ministries do the same. Isemary and her peers sew these shirts, quality inspect them, pack them and ship them. They are part of the enterprise that exists to care for kids. They aren’t junk and they don’t make junk. They are beautiful and they make excellent product. They are part of a commercial solution that begins with the power of purchase. Isemary has broken the orphan cycle. At GO Project, we’ve added to the “teach a man to fish” saying. Here’s how it goes here: “Give a man a fish, feed him for a day. Teach a man to fish, feed him for a lifetime. Invest in a man’s fish business and become one of his customers, and he’ll feed others.” It takes all three: givers, teachers, and investors. The combination means that brighter future for Isemary becomes reality. This Christmas season, we invite you to make this a Different December by helping meet the raw, real needs of children — like Isemary — growing up in the care of our local church partners. Your year-end gifts help pay for the unpredictable essentials that our caretakers constantly confront: spiking food prices, emergency health and safety needs, and gaps in daily care funding for kids. As always, 100% of your tax-deductible donations go to the care of children. To learn more about the impact of Different December giving, click here. Since CarePortal’s inception, this community has been working toward the day of a Church-centered child welfare system. The life of a pastor in Uganda is an eye opener. We’ve been in Lira, northern Uganda.